your loved ones was murdered? 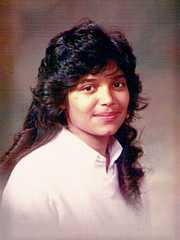 In the early morning hours of July 2, 1987, our daughter, Lynn Cannata was stabbed to death in front of her 2 year old son Matthew, by her boyfriend, Lawrence Garcia. She was 20 years old and 6-½ months pregnant at the time. No one thinks it will happen to them but about 1 in every 250 people in Colorado will be the victim of a violent crime this year! The odds of you being in a car crash in 2007 are around 1 in a 6,050. You are 24 times more likely to be a victim of a violent crime than have an accident. Do you know anyone that hasn’t had some kind of car accident?! In September, 1988, after being convicted of 2nd degree murder, Garcia was sentenced to 24 years in prison. We thought it was all over with and we wouldn’t have to deal with it again until he had served his 24 years in prison. means it is finally all over. For the next 18 years, we faced the complicated and often intimidating criminal justice system in Colorado on our own to speak on behalf of our voiceless daughter. Our case went to the Appeals Court, then to the Supreme Court, and after nearly 6 years since Lynn was murdered with multiple hearings, the conviction was upheld. Then, 8 years after Lynn’s murder, came the parole hearings and the half-way house hearings. And for the next 10 years we had to write letters and attend five parole hearings and countless half-way house hearings just to keep Garcia in prison to serve the sentence that the courts imposed on him. Garcia walked out of prison on Oct. 25, 2006, a free man after serving the maximum 18 years of a 24 year sentence because of Colorado earned (good) time. a life changing event on your own? Because of our experience, we have started Voices of Victims, a non-profit organization providing post-sentencing advocacy and support to victims of violent crimes. We provide information on the post-sentencing process, accompany the victims to the hearings, and provide financial support when needed for travel, lodging, and meals to enable the victims to attend all the relevant post-sentencing hearings. For more information, please call Joe at 303-777-0112.